1.An unlikely entry, but at number 1 we have: getting my car stuck in mud, with Anais Higgins coming to the rescue! A great example of two minds and bodies being better than one and that a little creative thinking can be useful in any area of your life. We ended up splattered in mud, with 4 ruined car mats and a reminder that with the right team anything is not only possible, but that even stressful scenarios can turn out to be fun. I first met Anais back in 2011 when we embarked upon OYAP Trust’s Young Leaders Programme, I’m so glad we became friends – we regularly find time to get to the theatre together, and in addition to helping rescue my car from mud this year, Anais has been there to provide last minute accommodation for me in her spare room (when a nearby workshop was finalised late in the day), has sent tokens of motivation in the post when I was having a tough month and [SPOILER ALERT] made sure she was there in person for the final event of MÓTUS 2018, which was also my final event as an assistant director for the organisation. If you haven’t got an Anais in your life, you’re missing out! 2. 2018 was my first full year at the helm of the contemporary dance classes at Arts1 School of Performance in Milton Keynes. After focussing on technique for our first term together, we entered ‘show term’ – preparing for Cinematic with a piece inspired by the film ‘The Imitation Game’ and Bletchley Park. I couldn’t have asked for a more enthusiastic group of students to get behind my idea – they launched into learning my material, and approached tasks to create material through coded instructions with as much gusto, plus, were game to incorporate a section of live improvisation from a score into the piece. I loved delving into the codebreaking at Bletchley Park through movement, and was very proud of the piece we created together and were able to showcase in Cinematic, Jump Start and also Generations Dancing at the University of Bedfordshire. The students also donned their tea dresses again during IF: Milton Keynes International Festival – getting involved with Back to Back Theatre’s ‘The Democratic Set MK’. It has been wonderful to encourage their open approach to new collaborations and artistic opportunities – long may this continue into 2019 and beyond. 3. Going to the theatre and seeing work whether it be dance, theatre, mime or beyond is always time well spent in my opinion. I’m lucky to have seen lots of wonderful performances this year, but 2 in particular struck me most – Lost Dog’s ‘Juliet & Romeo’ and Robert Clark’s MASS. Juliet & Romeo poses the question: what if the protagonists had lived - were now aged 40ish and in couples counselling. It manages to be both witty and poignant, with all of the movement an integral part of the story telling – I raved about it so much that a group of my school friends from sixth form (non-dancers) joined me for a second viewing when it toured to Oxford this autumn, and I even gifted tickets as a wedding present for my cousin – an accolade in itself – there aren’t many dance shows I’d dare to deem wedding present worthy! What’s more, the production is still touring if you want to give it a whirl! MASS is an altogether quite different experience, but which still takes you on quite the emotional ride. It’s an immersive performance where everyone is given a hooded garment to wear before entering the space – so performers and viewers alike are clothed in the same manner and as such everyone becomes part of the MASS. I was most impressed by how safe the space felt, and how much care was given in allowing you the power to make your own decisions about getting involved so that you felt comfortable. By the end of the evening, I felt much lighter and ready to interact with the world without so many barriers up – a revelation in this year’s political climate! Again, it’s an experience I’d like to share with others, so I’ll be keeping an eye out for the possibility of MASS touring. 4. Part of what has shaped my 2018 has been being playful and trying new things. For example, I participated in a 3 day masterclass initiative with Extraordinary Bodies at The Point, Eastleigh and got a little taste of some aerial work in a harness…sowing the seed that perhaps this is something I’d like to experiment with/ do a little training in somewhere down the line. I also managed to make it to one of Tim Casson and Hamish MacPherson’s PlayDance sessions at Chisenhale – which very much encapsulated this sense of re-finding play in one’s professional practise – being sure to ‘do’ play as much as ‘deliver’ play. Plus, on my list of 3 new things to do in 2018 written at the outset of the year, was to attend The Playground at Rambert – an evening of speedy collaborations which is currently happening once a month - 4 artists lead different explorations in studios throughout the building before coming together for an impromptu sharing to round everything off. I managed to squeeze many of The Playground sessions into my diary this year and was particularly enamoured by the evenings I spent playing under the direction of Darren Ellis and Liam Francis. Thank you to all the artists involved in making The Playground happen - why not drop into a session yourself in the New Year? 5. After reconnecting with Lisa Spackman (Two Thirds Sky) at the end of 2017, I was invited to work on some research and development of a new duet inspired by the life and works of artist Tamara de Lempicka. Working with Two Thirds Sky is always special for me for a number of reasons, including that it gives me the opportunity to dance with Laura Gibson who was my contemporary teacher during my training at Stella Mann College, such a privilege. Also, Lisa really encourages us to discuss and delve deeper into the source material – challenging our mental engagement and physical approach to tasks simultaneously. While this is tough at the time, especially as tasks are layered and Lisa pushes our skills in fragmenting, compartmentalising different body parts and then combining with other sequences, it not only creates a rich movement language for the piece but also inspires me in approaches that I can take when I am choreographing outside of the Two Thirds Sky studio time. We performed ‘From the Windows Gaze’ in a studio sharing with an invited audience which included my A Level Dance teacher, Michelle Gaishauser, and dance maker Richard Alston – I’m not sure who I was more nervous to perform for! 6. Appropriately, the final entry for this half of the list was my final festival as an assistant director for MÓTUS. As always, festival time included wearing many hats to make sure all the plans laid out in funding applications written earlier in the year came into being. One of the projects I took the lead on was the MY TURN collaboration – an opportunity for young people to choreograph a duet in partnership with a professional adult counterpart – you might have spotted my blog post on it earlier this year. I also had a wonderful time choreographing an ‘Alice in Wonderland’ inspired piece with students at Great Linford Primary School – with many adult sized dresses and doll sized dresses thrown into the mix! Not only did the cast perform 3 times at MÓTUS in the centre:mk, it was also an honour to see them reprise the performance several weeks later for their school fete and to hear feedback from parents that their children loved watching back a video recording of their performance on repeat – in the words of one parent “it’s an experience that will stay with my daughter for a very long time”. Another highlight of the festival was getting to work with Miranda Laurence who collaborated as a dramaturg on the professional commission Surprise! choreographed by Chris Bradley. 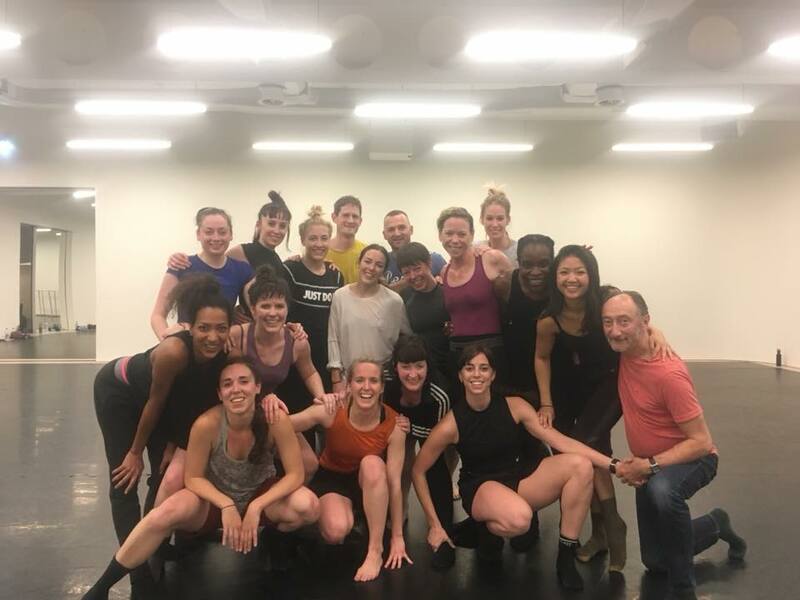 Miranda was able to interject ideas into the studio and help find clarity in narrative for us as performers – in understanding the story attachment of a certain movement sequence/ task which could then be read more easily by an audience. After such a final flurry of activity, it was time for me to step away from the MÓTUS team – I look forward to seeing what activities they have planned next for dance in Milton Keynes from the other side. So there you have it – the first 6 highlights of my 2018 – check back in soon to see how the second half of my year panned out and how I put my new-found time to use having left the demanding cycle of planning, producing and promoting year round at MÓTUS. Tonight, Fri 20th July, sees the ultimate performances of MY TURN in the foyer of Milton Keynes Theatre between 6.45pm and 7.15pm. A free pre-show extra for audiences to whet their appetite before heading to the auditorium to enter the world of Flashdance – The Musical. So, what exactly is MY TURN? It’s an opportunity for young dancers to try their hand at choreography with 1 to 1 professional guidance. 3 young choreographers were selected through an audition process and each was paired with a professional dance artist with whom to create a duet. The resulting duets have stemmed from the ideas of the young person; with guidance on how to translate written ideas or imagined concepts to dance given by their professional adult partner. It is these 3 duets which will be shown in the foyer at Milton Keynes Theatre. My relationship to the project is multifaceted – I am one of the adult dancers who has been through the process and will perform as one half of a duet this evening; I was also the instigator for the project in my former role as an assistant director at MÓTUS. As such, I thought I’d share a few musings on MY TURN. My reasons for initiating this project were twofold – not only wanting to provide a choreography experience for young people, but also looking at how to reach a different audience for MÓTUS. Over the years that MÓTUS has been active, we often programmed work in Margaret Powell Square (just in front of MK Theatre) during pre-show time slots - thinking that theatre audiences would enjoy an extra spot of dancing as they meandered in. However, we tended to find theatre attendees were a little shy of watching work in the square, in general it felt as though they were unsure whether they had permission or time to stop and watch given they had a ticket booked for a specific event at the theatre. A few years ago, while I was working in Wales, I attended the theatre in Newport where I came across and was inspired by an initiative called ‘Dance Shorts’. I’d gone to the theatre to see Scottish Dance Theatre but was surprised in the foyer before the show to see another 10-minute dance work by TaikaBox. It really made the evening stick in my mind and felt like I’d got to see a bonus performance that day. With this in mind, for the MY TURN project MÓTUS has partnered with Milton Keynes Theatre and Selladoor Worldwide to present the performance of duets within the foyer of the theatre. Hopefully some of the audience this evening will get to experience a similar delight of bonus performance and that, with the duets being located in the foyer, worries will be eased as to whether they will get to their seats on time! Now for a few behind-the-scenes thoughts sparked from the choreography process itself and what I learnt in supporting my young counterpart’s creation. I often find that dance is one of the poorest of the performing arts, and some of me wonders whether this is to do with the amount of ownership young dancers are able to experience being limited within regular technique classes. (Not that there is anything wrong with attending technique classes, it’s something that still feeds me and makes me happy to this day!) 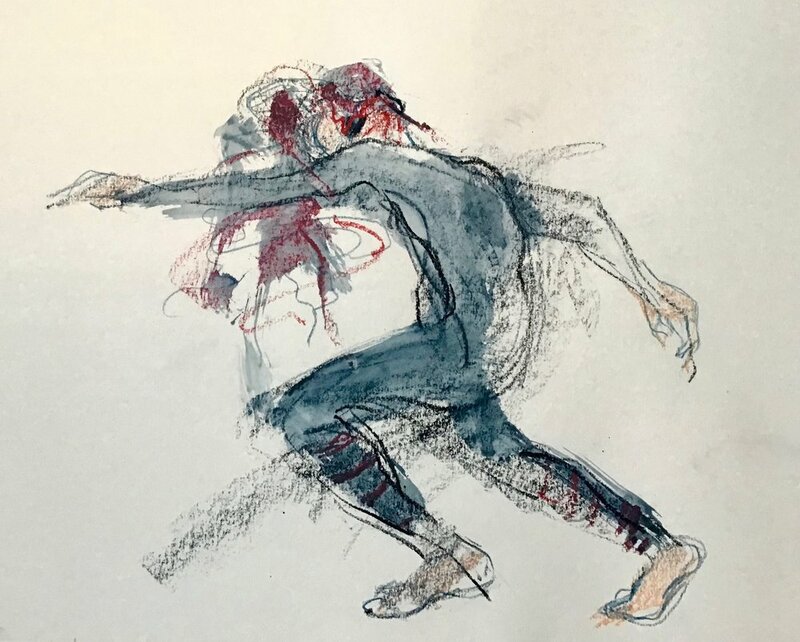 Another part of me ponders whether there is something in dance’s perceived lack of connection to paper – musicians frequently work with scores, and actors scripts – but where is the tangible thing a dancer can hold, create from and refer back to?! So, when my young partner has ideas written down on paper – a concept which she has proposed – but is unsure how to bridge the gap from paper to movement, is it any surprise? Over time as a dancer, you build a toolbox of tasks to help bridge this gap – and one which I suggested as a starting point in this instance was for us to go through my partner’s text and pick out all of the verbs/ action words – which instantly gave same impetus for movement to be borne. As part of the process, I sometimes suggested ‘in between rehearsals’ tasks for my partner and myself, one of which was for us each to find 3 pieces of music that we would like to try out our devised movement material to. What was really interesting for me to observe in us doing this, is how much more language my partner had available to her in describing the music choices and its relationship to her initial concept than she did when talking about the movement. For me, this feels a little like when I take my car to garage – I just can’t find the right words to get at what I mean in that scenario as I don’t feel like I know how to speak the language! By focussing so much on movement in dance class, do we forget to give young dancers the language for them to feel comfortable and take ownership for their own creations? Whilst the process has really nudged me to consider how it might be possible to start to achieve these shifts in intention where I teach young people class, it has also been really rewarding to see my partner’s progression and growth in confidence with decision making with regard to dance. The duets have already had their first outing during MÓTUS in thecentre:mk where they were one of the most commented upon items of the line-up. Here’s hoping they go down as well tonight! This morning the UK has woken up to a leave vote in the EU referendum. There are uncertain times ahead across the board - there are plenty of questions with unclear answers economically, leadership-wise and the list goes on. In Milton Keynes, leave took 51.4% of the vote. A place, where last summer, Milton Keynes Council agreed unanimously to "to initiate a process to take forward a bid for Milton Keynes to secure shortlisting to become European Capital of Culture 2023". What happens now in that process is as yet unknown. So it seems to me that this is a prudent moment to pause for thought and consider what positive steps can be taken in the cultural community in MK going forwards whichever way negotiations go. With regard to the dance community specifically (simply because that is the segment which I know best) can we be inspired by the notion of being ‘stronger together’ to build our community into the future? In Milton Keynes, we have an abundance of local dance and theatre schools; BTEC, GCSE and A Level dance courses; theatres, festivals, and professionals whether they be teachers, choreographers or performers. This is of course fantastic as there are so many benefits in bringing people together socially to dance, as well it being both a physical and creative activity. Sometimes though, I worry that we’re all so busy and focussed on our own little territory of the dance market in MK that we forget about the bigger picture. Of course those of us working within this sector need to earn a living and so holding onto our participants, class attendees and audiences is highly important in enabling this. However, is creating our own little isolated pockets of dancers a disservice to our overall dance community and perhaps even the dancers themselves? Is it possible for us to support each other’s projects without detriment to our own? Can we encourage inquisitiveness from students in exposing themselves to the influence of different dance styles both as audience members and participants to find and define their own preferences beyond the bubble of one syllabus, school, class or teacher? I’m not saying that I have all of the answers, but maybe we can figure it out together. As a dance artist, I know how hard it can be fitting in going to class or catching performances, but I also know how important it has been and still is to my own development and career. If we stop supporting events, they’re going to stop happening. It saddened me to hear last night that The Castle Theatre in Wellingborough is closing and likely to be dark for 2 years. This was one of the most local theatres to us regularly programming small-mid scale dance companies. Hopefully you might be able to make it to some of them too – let’s stay positive and spread the word across the dance community in and around Milton Keynes. Plus if you know of any other dance events going on please do shout about them - we can only support each other's events if we know about them! May: A manic month of MÓTUS - the ultimate 'how many hats can you wear at once' challenge what with assistant directing, choreographing and performing simultaneously! July: Featured a little more choreography - working with students at CentreStage Theatre School MK to create a piece for their summer show. August: Saw me travel out to perform in Germany with Ffin Dance for the third incarnation of Tanz@Namedy - always a treat! December: A joyful research and development project with Hannah Moore at Halsway Manor as part of her BBC Performing Arts Fund Fellowship to round off the year! So there you have it :-) Thanks to all of the lovely people, companies and organisations who I've spent 2015 with...I hope we get the opportunity to meet again in the new year and beyond! So Sunday July 5th saw the culmination of 'For the Fallen' in performance at the MK Rose, Campbell Park amidst a backdrop of handmade banners. After a sweltering day of rehearsals onsite on the Saturday, the weather took a much more tempestuous turn for the performance day - sending the banners a-fluttering while the performers (and audience!) remained resolute. Thanks and congratulations must go to all of the groups involved, namely: Open University Dance Group, Stantonbury Campus, Initiate YDC, Bollywood Dance Group, Long Meadow School, Graduates, Shenley Wood Village, CentreStage Theatre School MK, Red Kite Dance, Samuel Whitbread Academy and Bedford University. Looking ahead, I am now focussing on another choreography commission with students at CentreStage for their upcoming performance 'Let's Face the Music and Dance'. For this piece, I am working with ballet students but challenging them to extend their movement language with some contemporary vocabulary. We're nearing the end of the process and the dancers are doing incredibly well - coping with foreign movement, retaining the structure of the piece, building stamina and (to top it all off) counting in 5s! This week see us enter full cast, technical and dress rehearsals before the performance itself takes place on Saturday 18th July at The Venue MK. So after all of my dance performing escapades this year with Two Thirds Sky, Ffin Dance and MÓTUS, the summer has brought with it an influx of choreographic commissions. A lot of my attention is currently focussed on 'For the Fallen' - a Great War MK project commissioned by Westbury Arts Centre. Chris Bradley, Helen Parlor and myself are working with 11 different community and school groups to pull together a site-specific commemorative dance piece alongside a banner installation created by textile artist, Vinny Stapley. I'm working with 4 different groups - each currently at different stages of the rehearsal process. I had my final rehearsal with the Bollywood group this weekend - who it was great to get on site with at the MK Rose with and lift the material out of the studio. Tonight sees the last of my manic Tuesday evening dashes from one rehearsal to another, as I finish rehearsals with a group of young dancers from CentreStage Theatre School MK. They have been looking at the role of nurses in the war - particularly exploring the notion of care and support to get soldiers back on their feet. Later on this evening, I'll be working with a group of adults who have joined the Open Dance Group at the OU. This group is currently mid-way through rehearsals, using a strong theme of semaphore and messaging. We have already constructed lots of lovely material - so the plan for tonight is to get on with organising and arranging so that we can put a definite structure together. Last but not least, I am working with Red Kite Dance in Aylesbury who are still at the outset of their rehearsals. Again, we are exploring nursing, through the themes of after care and recovery. I am finding it really interesting to work with the two groups on this subject matter as their age and life experience is so different and brings about very different images and approaches. The final performances will take place at the MK Rose in Campbell Park at 3pm and 5pm on Sunday 5th July and will be free to attend. Do come down to support this cast of wonderful community performers if you are about in Milton Keynes. So it's been a while since I've posted here but now I'm back with a vengeance, inspired by the springtime sunshine streaming in through the window! I'm sure it will not have escaped your notice that Easter is impending what with the hordes of chocolate eggs which have invaded the supermarket aisles. What better way to enjoy those extra calories of chocolate-y goodness guilt-free than by signing up to a dance workshop on the 4th April? The day will consist of morning class, followed by learning some repertoire inspired phrases and then a creative session to round everything off. So if the start of springtime has put a bounce in your step, be sure to put that bounce to good use in your dancing escapades and come join in with the Open Dance Group's Easter Workshop! First up, a quick reminder that I’ll be teaching the Open University Group dance class for the next few weeks to sandwich Easter (8th, 15th, 29th April and 6th May). The OU group runs every Tuesday from 6-7.30 and is open to anybody – you don’t need to be a student at the OU. You are welcome to drop in to odd classes (which is what I do when I’m not teaching!) or you can commit to a 4/ 5 week block at a time with a different dance artist taking the reins. One of the standout elements of the class is that it is open to adults of all levels and abilities from beginners with an interest in dance right up to professionals – the atmosphere is very supportive and friendly. So if your attention is piqued, please do come down a join us in the Hub Theatre tomorrow night. Lots of lovely space to shake a leg with the Open Dance Group every Tuesday! Onto the next, this weekend saw the first entire cast rehearsals take place for Rosemary Lee’s ‘Under the Vaulted Sky’ so it’s starting to get very real. It was a chance for everyone to see the scale of how many people are involved and to visit the Cathedral of Trees for the first time. Weekly rehearsals will start proper from May splitting down into smaller groups to create and begin learning journeys through the piece before the entire cast reconvenes to slot back together. I’m going to be working with the youngest members of our cast aged 9-11 years so am sure I’ll be kept on my toes! Watch this space and make sure you’ve got 18th-20th July down as performance dates in your diary. Post by IF:Milton Keynes International Festival. Talking of dates, if you had previously pencilled MÓTUS in for the 28th/29th June, it is now time to ink it in permanently since all of the funding has been raised. Keep your eyes out in the next few weeks for programme announcements – workshops, masterclasses and performances aplenty! All in all, lots of exciting developments in the Milton Keynes dance bubble! First up, the deadline is fast approaching to apply to be one of the performers for ‘Under the Vaulted Sky’ choreographed by Rosemary Lee. This is an opportunity to perform as part of Milton Keynes International Festival alongside a whole host of spectacular events this summer. If you’re interested in getting involved, hotfoot it over to the IF website to download a form and return it by 5pm Friday 21st February. If that’s not your bag (or even if it is but you want to dance in Milton Keynes as much as possible!) then look no further than MÓTUS – two days of dynamic dance performances, workshops and talks on 28th and 29th June. This festival is being artistically led by local choreographer Helen Parlor (who was assistant choreographer for the Paralympic Opening Ceremony in 2012) and plans are underfoot for an exciting programme. For the festival to go ahead some additional funding is required – take a look here. There are several different rewards on offer to be snapped up: access all tickets for the festival, first views of performance pieces in rehearsals and advertising space in the festival programme. If you can support then please do – let’s make this a dancing summer to remember in Milton Keynes! 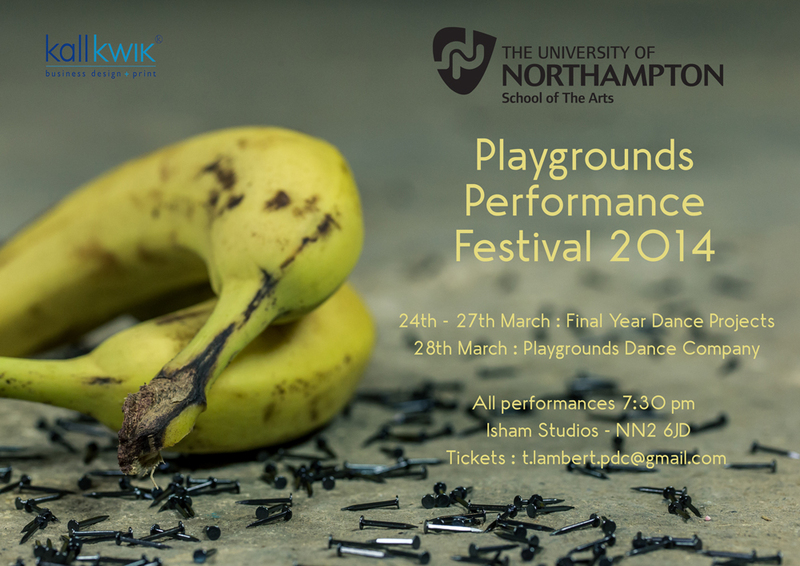 The last two weeks have seen me working with Playgrounds Dance Company, the undergraduate company of the University of Northampton. This has been the first phase in creating a new piece to add to the company’s current repertoire (which will be performed for the first time on 28th March – see information below). As a starting point for movement generation I requested the dancers use the concept of the physical nature of swimming combined with the linear pathway we choose to implement when occupying lanes in a pool. Along the way in the creative process there have certainly been some choppy waters encountered (but then I do suppose this comes with the territory when swimming!) and I found the most difficult ask was being able to find headspace away from the piece during such an intense period of time in the studio. Having spent my last day at Isham Studios with the company yesterday, making a start on cleaning movement and tying up the looser ends along with Matthew Gough (Artistic Director), I feel happy to be able to leave the material in the dancers’ hands to breathe and develop in the time we have apart. I will return to the studio at the beginning of March and am hoping the intervening period will give me time to step back and consider the piece more objectively whilst I am not in the midst of creation. So I appear to be roller-coaster riding into 2014 and am writing this as a procrastination tactic from packing before heading down to Bridport this evening! The week ahead sees the continuation of the research and development process for Home from Home under the direction of Helen Parlor before sharing at Bridport Arts Centre on Saturday. The process so far has seen us touch upon and explore 2 different sections with a 3rd in store for the coming week. Over the past few days of rehearsal, we have been working on a duet between Richard Headon and myself. It has been interesting to see how our two worlds collide and the balance of our comfort zones shifting as we meander from movement based to text based activities. The nature of this has very much echoed the relationship dynamic we are exploring in the shift of care-giving from one party to another. Now to make sure I’ve got enough chocolate packed to see me through week 3….